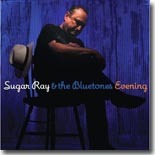 Severn Records does it again with Evening, the fine new CD from New England blues veterans Sugar Ray & the Bluetones. It's this month's Pick Hit. California native Shane Dwight moved to Nashville, and musically, it's been a good transition as can be heard on our Surprise feature, A Hundred White Lies. The Fabulous Thunderbirds have recorded prolifically since their first release in 1979, but that debut recording, 'Girls Go Wild', is still our editor's favorite T-birds disc --- its this month's Flashback feature. Our What's New section features new releases from B.C Read, Tom Hambridge, Robert "Nighthawk" Tooms, Trent Romens, Mark T. Small, Julius Pittman & the Revival, Fred Sanders, D'Mar & Gill, and more.